A storm swept the world in 1968. It started in Vietnam, then blew across Asia, crossing the sea and the mountains to Europe and beyond. A brutal war waged by the US against a poor south-east Asian country was seen every night on television. The cumulative impact of watching the bombs drop, villages on fire and a country being doused with napalm and Agent Orange triggered a wave of global revolts not seen on such a scale before or since. 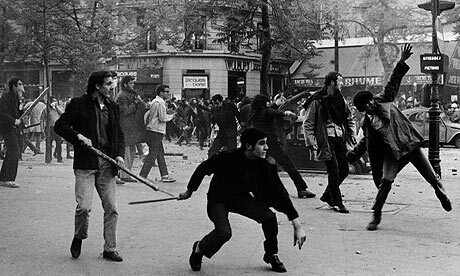 If the Vietnamese were defeating the world’s most powerful state, surely we, too, could defeat our own rulers: that was the dominant mood among the more radical of the 60s generation. Also, The Goethe-Institut looks at the events of ’68 over here. 1968 was a draft. This is a volunteer military. That makes a world of difference to middle America. An odd way to deal with History. No “cumulative effect” happened, just because the media were not concerned with Vietnam war, alas ! May 68 movement was not born in Vietnam. Opponents to VN war were a minority in the demonstrations and discussions in Europe. In France, 10 millions workers were on strike for salaries, working conditions, Unions right to exist inside companies plants, etc. There has been a great hope for more democracy, initiative, creativity. ..” L’imagination au pouvoir !”. It did not last very long, even if the moral standards underwent a thorough change, especially concerning women rights . All the paper is a mixture of half thruth and complete fancy.